Whether it’s Slash, Schenker, Hammett, Rhoads, Hendrix, Page, Satch or any other great rock player…you can bet they’re using the sound of unison bends in their licks and solos! But what are unison bends, how can you nail them and how can you use them to play killer solos and licks of your own? In this lesson you’ll learn the secrets of playing monster unison bends as well as how to use them for powerful and high impact solos. The 2 most important unison bends all the great players use! How a simple tweak can double the number of unison bending licks you know! Once you’ve studied this lesson you’ll be on the road to bending like a boss! 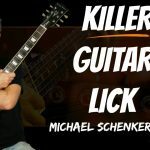 Blues Rock Licks – Unison Bends for Killer Licks! 0:09 Blues Rock Licks demo with unison bends. Check out this intro jam to hear the kind of blues rock licks you can play with the unison bends you’re going to learn in this guitar lesson. 0:31 Unison bends…what are they? If you don’t know what unison bends are, well you’ve definitely heard them before! It’s when we play the same note twice in a row, but using a bend to sound one of them. Even though the note is the same…the sound of the bend creates a cool effect. Here you’ll learn one of the most common unison bends there is. It’s show in the key of C# minor. Here we see another of the common bends you hear in all the blues rock licks of your favorite players. You’ll also learn an essential guitar technique for controlling your string bends. How good your blues rock licks sound is in large part down to how good your string bending technique is. Here you’ll learn some guitar technique tips for great unison bends. 3:40 Using Unison Bending to Create Blues Rock Licks and Solos. Here we’ll combine some of the unison bending moves to create some blues rock licks you can use in your solos. It’s not hard to come up with dozens of licks just by using a little imagination! Play both notes at the same time and you get a double stop unison bending. This is a favorite move of players like Slash, Hendrix, Wylde…pretty much everyone! Check out the essential technique tips for powerful double stop bends. 5:34 Blues rock licks can easily be created simply by combining some of these bends. Follow the picking tips and guidelines shown here to make them easier to play. 6:27 Now you can experiment with using these bends to create a load of blues rock licks of your own. Try anything you can think of and keep a note of what works best. Have fun!